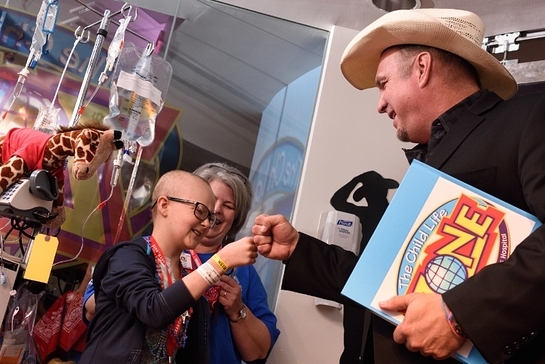 Garth Brooks was on-site to celebrate the grand opening of the newly renovated and expanded Child Life Zone at Texas Children’s Hospital in Houston, Texas on June 26, 2015. Funded through the Teammates for Kids foundation (which Brooks co-founded in 1999), the Zone provides a fun, safe and procedure-free environment for Texas Children’s in-patient population and their families. Texas Children’s Child Life Zone originally opened in 2001 and now features a completely renovated and expanded play space. The Zone offers a variety of video gaming choices thanks to the new Microsoft Media Wall and Surface Pro tablets. Patients can challenge their friends to a game of pool, air hockey or race car driving on the Zone’s arcade games. An expanded kitchen offers unique programming for patients and families to learn more about healthy lifestyles while cooking with the hospital’s chef. When the kitchen is “closed” the 24-foot kitchen counter doubles as an arts and craft bar. The Zone also includes an expanded production studio which offers patients the opportunity to explore and create music as a part of the hospital’s music therapy program. Kids can go “on air” each week as Radio Lollipop broadcasts their radio program throughout the hospital. With the new closed-circuit television system, patients on isolation will now be able to see what’s happening in the Zone and participate in live shows being broadcast from the studio. The Zone, located in the hospital’s West Tower and adjacent to other support services, is available to patients ages 6 and up and their families. The focus of the Zone is as much on the family (in particular siblings of patients who can often feel overlooked) as it is on the patients themselves who greatly benefit from the therapeutic play the Zone provides. More than 100 patients and their families attended the grand opening event and were given the chance to meet Brooks. Representatives from Teammates for Kids and Microsoft were on hand to show families the activities and resources available at the Zone. Brooks chatted with patients and families, signed autographs and posed for pictures leaving many happy smiles at the end of the day.